Iowa coach Kirk Ferentz says he will not lobby to improve the Hawkeyes standing in the B-C-S. Iowa is 9-0 on the season but the Hawkeyes are losing the national debate and stand a very good chance of being left out of the national championship game even if they run the table. Ferentz says he doesn’t look at those things and says he assumes they are in the mix, but says they still have three conference games left and that’s all they can worry about right now. Ferentz says the Hawks have done a good job all season of not looking ahead and there is no reason to start now. He says he is so uninterested in the polling right now and he says they will probably end up where they belong. “The suspense is not killing me, I can just assure you it’s not killing me, it hasn’t been… the suspense about this week that’s a little more prominent in my thought right now, my thought process,” Ferentz says. Ferentz says they cannot worry about what other people think. He says no one in their camp will cry about it. Ferentz says what he has learned is that the first team to complain is usually the first team to get beat. While the Hawks continue to win they are not earning many style points. Ferentz says they all realize they have three tough teams remaining and are not the type of team that goes and wows people. He says they just have to go out and find a way to win. 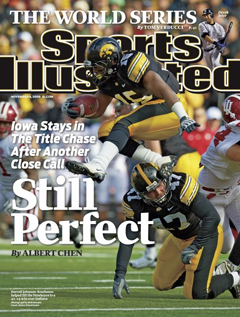 Iowa hosts Northwestern this weekend and Ferentz says the Hawkeyes best trait is their ability to handle pressure. Ferentz says one thing the team doesn’t do is panic during a game. He says they have done a lot of things not so well, but that is one thing they have done well is look forward and play well in the fourth quarter. Ferentz says a season like this one takes a number of big plays at the right time. He says to have a successful season, you are going to have tough moments where someone has to step up, and this year they’ve already had their share of great moments. Ferentz says when you don’t have those moments, you don’t win.